Here's what Ive done to try and mitigate this problem: New head gasket (was leaking coolant and oil around manifold and smoking like a biiiiiitch . -used OEM gasket at proper diameter), new valve seals, lapped valves lightly and tilt clearance of stems is within spec per my manual. Head was machined flat before installing. Compression 155 psi on ALL four cylinders. New water pump and associated oil seals and gaskets, Randakk's carb kit tackled step by step and everything replaced gingerly and double checked (my third set of GL1100 carbs rebuilt), new air filter, new fuel pump, filter and fuel lines, petock cleaned and rebuilt. Floats set at 15.2mm ( to allow more fuel because it's symptoms seem lean). 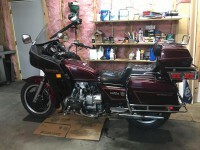 Gas tank cleaned and re-installed. Ran brake cleaner through left headers when apart to begin to clean out baked-on oil deposits. Idle screws 3.25 turns out. New o rings on carb/head interface. New spark plugs gapped correctly and resistor caps. New battery, charging system working great. Synced carbs with mercury sync tool at 1000rpms. 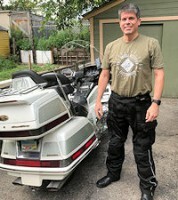 Ran marvel mystery oil and seafoam in engine oil and seafoam in gas for 25 miles on the road. Problem: Starts up immediately with choke but left side warms up a wee bit slower than right but does heat up. Then it steadily and subtly backfires every few seconds mostly out of the #2 carb and a little out of the #4 carb. It hesitates on left side only when quickly throttled, right side fires up like a monster. I've screwed with carbs so many times I thought I'd ask for advice at this point... The slight backfiring is accompanied by white smoke which dies down to almost nothing, but takes 25-30 minutes to happen. Smells like oil to me. My only guess at this point is either timing (waiting on a strobe light in the mail to check) is early or late on 2 and 4 or the oil rings are failing and fouling the plugs. The plugs are nice and brown, I'm not seeing any oil though. But the white smoke smells like oil for sure. The smoke, stuttering-backfiring is getting to me after all this work and Im not sure what to check next. Thanks for any help that could be offered up! Have checked wires yep, they're correct. Hmm I'll check the slide for sure. Do you mean the needle? I buffed all four slides and made sure the needles were all the same height. Taking carbs out again this weekend. Thanks for the tip! If the smoke is from the left side then do you leave the bike on the side stand ? Could also be the bike is still burning off some of the loosened oil in your exhaust as a result of the brake cleaner you have used - the oil residue might have been accumulating for a while.. If it is not blowing smoke after it has warmed up I would ignore it..
That's exactly the behavior you would expect when rapidly opening the throttle. The vacuum is measured in the intake manifold between the throttle and the cylinder intake valves. When the engine is idling and the throttle is mostly closed, the engine is not drawing much air, and the throttle is at the maximum amount of restriction, so vacuum is relatively high. When you rapidly open the throttle, all of a sudden there is little to no restriction to incoming air, AND at the same time, the engine still not requiring much air - so the vacuum plummets almost instantly. As the engine speeds up, it starts drawing more and more air, more than can easily get past the throttle, so the vacuum drops once again. Incidentally, this is the reason for accelerator pumps. When you rapidly open the throttle and the vacuum plummets, the fuel being drawn into the engine also almost completely stops - because the amount of fuel being sucked into the engine is dependent on the amount of vacuum present in the plenum. At low speeds it relies more on manifold vacuum to draw fuel (through the idle jet), at higher RPM it depends more on the vacuum generated by the volume of air flowing through the plenum (which is accelerated, causing a drop in pressure, i.e. vacuum). Because the fuel almost completely stops, in order to keep the engine running AND make it start to accelerate, the accelerator pump squirts a little bit of extra fuel into the plenum. This gets the engine going, which speeds up RPM, which then raises vacuum, and things run normally. This is why a malfunctioning accelerator pump or jet will cause the engine to bog down when the throttle is opened rapidly. Check to see if you can see the accelerator pump squirting fuel when you rapidly open the throttle. Thanks very much for the info. That makes it much more clear I appreciate it! Ok, I will pull carbs again and confirm the accelerator pump is injecting fuel when it should. It's a new pump assembly from Randakks, but I'm sure that doesn't mean it was installed correctly. Thanks again. Past 6000 rpm it screams like a maniac with no backfires or hesitation so just need to smooth out the low end. 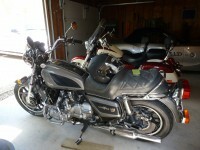 Have quite a few friends in CO and CA I intend to visit this summer and my GL1100 is the chosen steed. You don't need to pull the carbs to do that - just pull the air filter out, you can see the accelerator pump squirting fuel in when looking down into the carbs then - without removing them. Looking from the plenum into the carb, The butterfly you see is the choke (throttle is on the outboard end of the carb). Acel discharge is the small brass piece. Got a mirror and a bright light in the plenum and......only carb 3 is squirting directly into carb. The other three just kind 'get wet' around the base of the brass injector. Will pull assembly and clean brass nozzles again. Learned the hard way! Will, ahem, make sure to check accelerator squirt in each carb before full assembly and re-installation. Also found cylinder 3 and 4 have a weak spark and are skipping every now and again. Coil isn't cracked but since the cables are hard as a rock and I want this fixed right I ordered a new set of coils. Hopefully after that and accelerator pump confirmation she'll rip. Carb #3 contains the one and only acel pump mechanism. Its output take a circuitous path to get to the other 3. Starting at #3 it squirts out the tiny brass nozzle, and also goes thru the small connecting tube into #1. But it also goes thru a passage in the plenum casting to get to #4. And finally thru another small cross tube into #2. #1 & #2 were easiest to clean since those carbs have only one passage to the nozzle and I could get some pressure behind my carb cleaner spray. #3 and #4 have more intersecting passages, besides the nozzle itself, to distribute the fuel to the remote carbs. I bent a 0.010" wire in a "J" shape to poke into the small discharge hole in each nozzle. Finally got them all opened, and then flushed more cleaner fluid thru them. It takes patience, but it can be done. I found that grocery twist ties (like bread wrappers, etc.) are made from fine wire. They come in different sizes. I strip the paper coating off and measure with a caliper. You can also use a short piece of .010 guitar string. They are available in any music store. One string should last till the next century. Just finished going through all carbs again. Yep, only one pump nozzle was working. Confirmed float heights, vacuum slides moving freely, all jets clear and emulsion tubes clean. All new O rings. NO hesitation now when I gas it at ALL! Revs up like a beast! But the mid range still coughing, farting, sneezing like it's misfiring. Good power and response, just backfiring through carbs. Going to replace coils, wires, caps and plugs tonight and see if that helps. Beyond that, I'm getting tired of carb work! Been through three times each time with Randakks book, installed kit first time... Granted I missed accelerator pump functionality last time but the constant backfiring, coughing is ticking me off! I'll see what happens later. Guitar string worked like a charm! Very cold here, while installing carbs in the bottom floor of the barn the ceiling starting pouring, pipes above in barn froze because heater had **** out. Good times! RE setting the needle and seats. I have gone through the problems you are having. cleaned and adjusted the carbs 3 times before finally replacing the N and S's. The proper mixture is very important. I had no problem of dirt or blocked jets. I have an ultra sound cleaner. Works great. Not emulsion tubes. The needle and seat comes as a package. You will need 4 - one for each carb. The needle fits into the seat. proper adjustment is critical. AGAIN. Read the Randakks article on adjustment. Ok, just didn't know if you are talking about FLOAT NEEDLES AND SEATS or main jet FUEL METERING NEEDLES. Floats are adjusted to proper setting and I have installed new seats for the floats and needles. Still a'stuttering. I'll keep at it. One other thing that you could check is the vacuum advance. The vacuum hose coming off the number 3 carb goes down to the vacuum advance and as originally installed is open to residue chemicals eventually reaching the diaphragm and rotting through it affecting the mechanical advance mechanism. Putting a vertical loop in the hose stops the build up. If the hose is clean, sucking on the hose should activate the advance. Releasing the vacuum, you should be able to hear it snap back. Otherwise be sure that your ignition is working properly. Checked vacuum advance today. Installed new rubber line directly to carb #3. Applying suction you can hear advance mechanism move and snap back after. There is a tiny flathead screw in face of vacuum advance. Wonder if it's adjustable...Going to check all ignition connections (wires to coils which have been all replaced new, pulse generator near battery etc) with voltmeter later today. If all these check out, it's back to the carbs. Revved up it sounds great so I'm convinced it's still worth it. I've worked on tons of old Honda twins so this is new to me but I believe...I believe!!! if and when she's up and healthy....I visiting Maine and CO this year on it. humm did you change the jets?